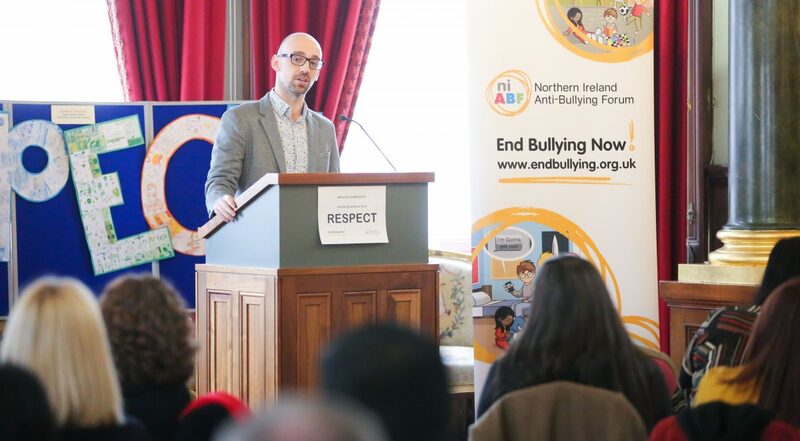 A highlight of this year’s Anti-Bullying Week launch was a performance by local poet, Colin Hassard, of his poem ‘Two for Flinching’. Colin is originally from Banbridge but now lives in East Belfast. In 2018, he was the Runner Up in the Seamus Heaney Award for New Writing and selected by Eyewear Publishing as one the Best New British and Irish Poets. Colin is the poet-in-residence for the BBC Radio Ulster show ‘Science & Stuff’ and is a former Ulster Poetry Slam Champion. He currently developing his first collection of poems with support from the Arts Council NI. We got a chance to sit down with Colin to have a chat about the poem and the inspiration behind it. NIABF: Could you tell us about what prompted you to write the poem? Was it from a situation you were in personally? What is it about? Colin Hassard: The memories of the bullying that happened to my friend at school have stuck with me for many years. I wrote the poem as a way to express my feelings about it: the sadness, the anger and frustration, and the guilt that I didn’t do anything to stop it. I believe it’s a poem that I needed to write for my own personal well-being and perhaps try and work through some of the questions I have from that time. NIABF: What do you hope the poem will do? CH: I hope the poem sparks a reaction in the listener. I believe it is a powerful poem as it directly mentions some of the horrible things that happened to my friend, and also raises a lot of personal questions. I’m sure a lot of listeners will have been in, or perhaps are in, similar situations, either as the victim, the bystander, or the bully. Perhaps the poem may even inspire people to tell their story. Thankfully the story that unfolds in my poem was able to have a positive, hopeful ending, but in too many situations this is not the case. Although my poem is written about a school experience, I hope this poem helps raise awareness that bullying at any stage in life is wrong and that there is help available. I would expect the poem to particularly resonate with males as the ‘two for flinching’ concept is something that was, and continues to be, prevalent amongst the male pupils. As young men, we were expected to be strong and to not show any weakness. These are old-fashioned ideas that need to be removed. NIABF: How else were you aware of bullying when you were younger? CH: Although at times I felt intimidated or pressured by some of the so-called ‘tough’ kids at school, I never felt like a direct victim of bullying. I was lucky in that I had a good group of friends and I would often play the role of ‘class clown’. By making people laugh, I think I became in some way exempt from being targeted for bullying. But I was aware of situations of bullying and of certain individuals who would regularly be targeted – and in those cases it is very easy to turn a blind eye and be thankful that it’s not you. To watch Colin’s performance, click here.